If youre building decks or hanging drywall, this driver makes the job a whole lot easier. A no-load speed of 0 to 900 rpm and 0 to 2,900 rpm couples with a maximum torque of 180 inch-pounds for serious fastener driving. All of DeWalts screwdriversthis one includedhave a dead" front spindle. The clutches are held apart by light spring pressure so the drilling clutch can rotate without involving the driven clutch and accessory. Just apply pressure to engage the clutch and youre driving. We really like the depth setter on this driver; you just turn the collar and precise adjustments are made. Each "click" of the collar is a change of .007 inch, and a full revolution changes your depth setting .083 inch. (review by Kris Jensen-Van Heste of Amazon). This tool does not come with a battery or charger." 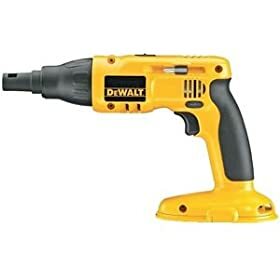 This is great screw gun, lot of torque. The only difficulty I have using it is it won't engage until there's pressure on the screw being driven in. I used a cordless DeWalt drill for driving screws in and liked the chuck turning as soon as you hit the trigger. This does not work like that but I'm sure it's something I'll get used to. 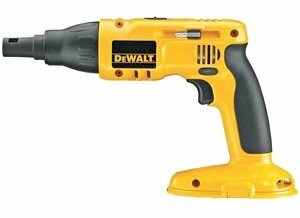 I like DeWalt tools, so far I have found them to be durable, long lasting, and their batteries last a good amount of time doing a job. That is the 18V batteries. I would recommend this tool.